Shuri Castle is one of the symbols of the Japanese city of Okinawa. 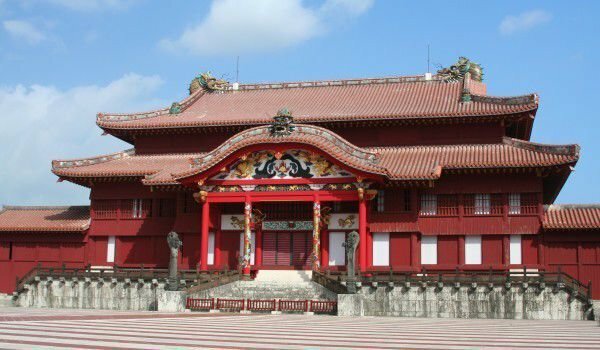 This beautiful Asian Palace is the largest in Okinawa, but the logical and the most remarkable and magnificent historic structure. Shuri Castle was built on a plateau with an altitude of about 120 m above sea level. Rising from the ashes after being completely destroyed at the Battle of Okinawa in 1945, Castle Shuri was absolutely restored with its original architecture. Construction began in 1958 and ending 1992. .
Shuri has an elliptical shape, in the east-west direction it has a length of 350 meters and in the south direction a length of about 200 meters. There is no reliable data of when and by who built the original Shuri, but archaeological excavations show that the predecessor of the castle was another mansion, built in the second half of the 14th century. Palace Shuri is the central residence of the ruler of the Kingdom of the Ryukyus, which reigned in the southwestern islands of Japan about 450 years ago, established supremacy in 1429 and continued until 1879, when the kingdom was abolished. Of all the countries the castle has natural fences - the north mountains, Sueyoshi Mountainprotect it and Torazuyama Mountain, also known as Tiger head also acts as protection. The southern side of Castle Shuri is secured by the Kanagusuku River. The east is almost guaranteed safety of the Nagera River and remaining on the west line is the Makabi River. Thus seems a natural fortress and very suitable for a royal residence. Castle Shuri opens a wonderful view to the port of Naha, which in the past has been a huge plus for the House of Ryukyus, which has relied mainly on trade for its prosperity. Inside, the Shuri has extremely interesting things that raise frequent tourist visits there. Right in the middle of the palace is a large courtyard, called Una. Around the courtyard are arranged main buildings of the complex, which are named Seiden, Hokuden, Nanden and Bandokoro. This once housed a stage where the rulers of the Ryukyu held ceremonies and political events. The main building at the Castle Shuri was always where they held the most important political and religious ceremonies.